Many of us change oil, check brakes, and do all of the common service to our vehicle, however...injectors need servicing from time to time as well, especially in high performance automobiles. Your fuel injectors spray into the combustion chamber up to millions of times over the life of your vehicle. The seals and other serviceable parts degrade or clog over time. Many Automotive OEMs recommend cleaning injectors every 60-90k miles for top performance and emissions. If your car is stumbling, running rough, getting poor millage, or failing emissions test, it's possible your injectors simply need servicing. Keep the air clean and get maximum gas millage with serviced injectors. Ensure that each cylinder is getting exactly the same amount of fuel for accurate air/fuel ratio readings and tune for maximum power, engine safety, and efficiency. When modifying a car for high performance or racing, you could waste untold money without properly functioning injectors. 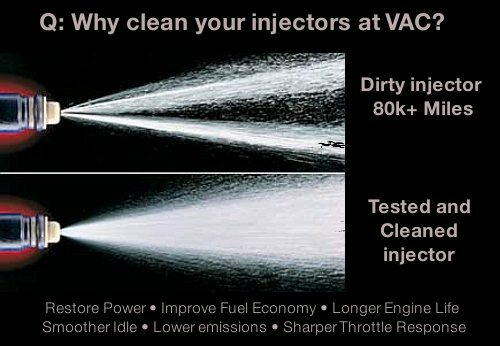 VAC offers Fuel Injector Service for a variety of fuel Injectors and automobiles. Injectors including but not limited to Bosch, Lucas, and Siemens. VAC Tech Tip: We know many of you have a BMW with over 100k miles. With gas prices higher than ever, injector servicing may help regain lost gas millage. Send in your injectors for service with minimal downtime to VAC, BMW experts.